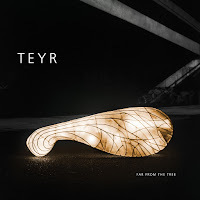 There are countless bands following a similar path of British acoustic music, but now and again one stands out - TEYR is such a band. With a debut like this, UK folk music is in good hands. Deeply thoughtful and crafted. A dazzling range of skill. Far from the tree it may be, but it is juicy fruit. The playing is exemplary, [they] mesh and merge beautifully. Boundless energy, imagination and instrumental expertise. If you only see one thing today, see TEYR. Musicians of this dexterity, quality and charisma make post-trad ensemble TEYR one of the most playful and artful groups around. High octane folk drawing deeply from their combined heritage - three consummate musicians playing with verve, mystery, magic and a healthy dose of disrespect for pointy headed purism - one of London's finest trad groups in many a year. A sparkling and iridescent display of accomplished musicianship. Among the best that folk has to offer. Far From The Tree is an album with a colourful, rich soundscape, where the faultless internal balance of the musicianship is expertly conveyed. Far From The Tree is a stunningly crafted release, the kind of music that builds on tradition with such care that it feels perfect. The group Teyr is essential listening. Ten works of sculptural beauty that demand our attention. Top notch music of one of the greatest bands that has come out of the English scene in recent times.